In 1753 Sir Hans Sloane, an Irish-born physician and naturalist, left his collection of 71,000 books, manuscripts, natural specimens and other objects to the nation in his will, in return for a payment of £20,000 to his heirs. The collection was used as the basis for the British Museum, the world’s first national public museum, which was established by an Act of Parliament on 7 June 1753. It opened on 15 January 1759, offering free admission to all “studious and curious persons”. The museum was first located in Montagu House in Bloomsbury. During the 18th century it attracted around 5,000 people per year, but its popularity increased greatly in the 1800s. In 1823 George IV donated the King’s Library to the collection and this led to the construction of the main quadrangular building and the circular Reading Room that are the centre of the museum today. These were completed in 1857. To allow room for expansion, the museum’s natural history collection was relocated to a new building in South Kensington during the 1880s, which is now called the Natural History Museum. The book collection, which had been housed in the Great Court around the Reading Room, moved to the new British Library building in St Pancras in 1997. The Great Court, which had effectively been closed to the public since 1857, was then refurbished at a cost of £100m, including the construction of a new glass and steel roof that made it the largest public square in Europe. 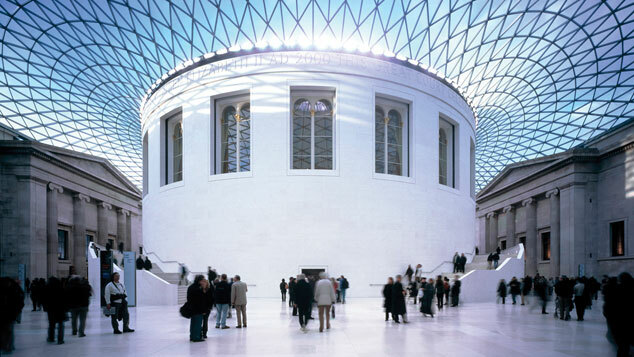 Today, the British Museum has over 3.5 million objects on display and attracts more than six million people every year. "Ill can he rule the great that cannot reach the small." This entry was posted in Uncategorized and tagged 15 January, 1759 by Admin2. Bookmark the permalink.